Our company offers complete range of web development solutions based on advanced technologies and platforms. We are focused on the development of high-quality web applications for a variety of business challenges. Understanding of your essential goals is important for us in order to help you with their successful implementation. Nowadays, the whole world became a single market and web technologies make it possible to take full advantage of opportunities presented there. Our company offers complete range of web development solutions based on advanced technologies and platforms. And it does not matter whether it is a simple website or enterprise cross-functional system. Many clients, who have already entrusted the Lvivity team with their projects development, became our respected partners. We are happy to provide our clients with long-term support and technical assistance, addressing all the challenges they might face doing business in future. Individual solutions provide you with an important advantage of full compliance with your business needs. We utilize our expertise and technology solutions to develop functional and interactive web applications that focus on pursuing objectives you set yourself. Reliable and flexible software architecture enhances its usability and reduces maintenance cost. In case you need a web app which for your personal or business needs, we will be happy to offer you full-cycle web development services or a dedicated team. The front-end and back-end development is the process of website construction which is divided into two parts, client and server end. This combination is necessary to create a complete and fully functional website. We use the best industry and engineering practices to develop the project’s UI/UX, administrative and server parts and make them execute functionality that exactly corresponds to the client’s needs. There is no perfect software programming language. Thus, working on the project, the Lvivity experts choose the most suitable solutions from a technical perspective. From a concept and strategy to design and integration – Lvivity develops web solutions for businesses, from small companies and startups to large corporations. We understand well enough how important for business scalability is. Therefore, we pay much attention to the code architecture, its quality, and optimization compliance. Our end products are easy-to-maintain and easy-to-upgrade, and it will not require huge budgets and resources to expand your web functionality in the future with us. 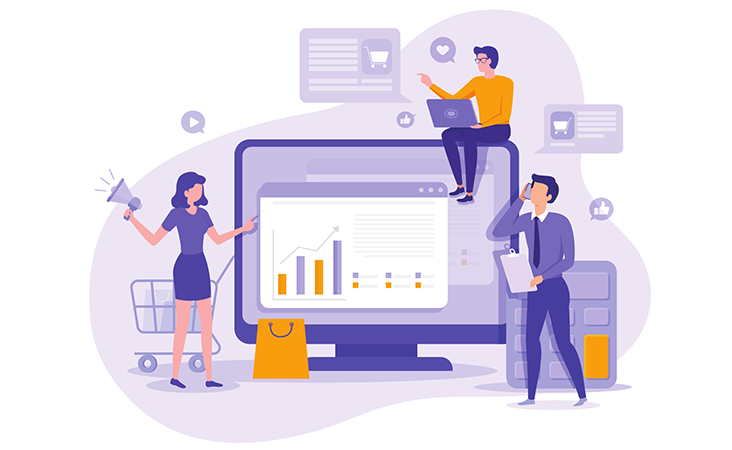 From a concept and strategy to design and integration – Lvivity develops web solutions for businesses of any level, from small companies and startups to large corporations. We comprehend well enough how important scalability is for business. Therefore, we pay much attention to the code architecture, its quality, and optimization compliance. Our end products are easily maintained and upgraded, and your company will not require significant costs and resources to expand their functionality in the future. Each member of our team is a professional in the niche, and all together we are able to develop projects of almost any complexity, without lowering down the quality standards. Individual approach to each client allows us to create custom, effective and unique product of its kind. You get the opportunity to invest your funds with maximum efficiency. We value our business reputation and entirely focus on achieving the goals. That is why each project is considered to be completed when our customers are satisfied with its final results. Lvivity guarantees cooperation transparency at all stages of project development, supporting our products in the course of the development process and providing pre- and after-sales services including technical support. The Internet is the best and the most efficient channel for products/ services promotion and sale. Besides, it is one of the most effective ways of managing business processes within a company. Numerous companies have already been able to assess the importance of web technologies which facilitate business development acceleration and profit growth. Therefore, they are actively using the latest trends in web development. And we are ready to help you with this!